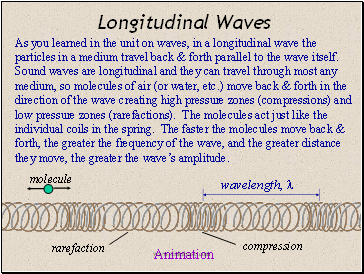 As you learned in the unit on waves, in a longitudinal wave the particles in a medium travel back & forth parallel to the wave itself. 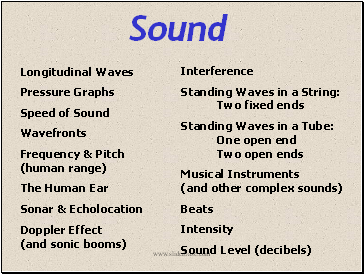 Sound waves are longitudinal and they can travel through most any medium, so molecules of air (or water, etc.) move back & forth in the direction of the wave creating high pressure zones (compressions) and low pressure zones (rarefactions). The molecules act just like the individual coils in the spring. The faster the molecules move back & forth, the greater the frequency of the wave, and the greater distance they move, the greater the wave’s amplitude. When sound travels through a medium, there are alternating regions of high and low pressure. Compressions are high pressure regions where the molecules are crowded together. Rarefactions are low pressure regions where the molecules are more spread out. An individual molecule moves side to side with each compression. 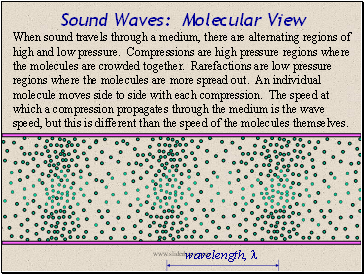 The speed at which a compression propagates through the medium is the wave speed, but this is different than the speed of the molecules themselves. The pressure at a given point in a medium fluctuates slightly as sound waves pass by. The wavelength is determined by the distance between consecutive compressions or consecutive rarefactions. At each com-pression the pressure is a tad bit higher than its normal pressure. At each rarefaction the pressure is a tad bit lower than normal. 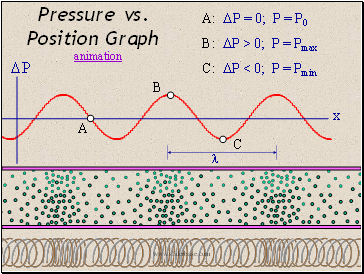 Let’s call the equilibrium (normal) pressure P0 and the difference in pressure from equilibrium  P.  P varies and is at a max at a compression or rarefaction. In a fluid like air or water,  Pmax is typically very small compared to P0 but our ears are very sensitive to slight deviations in pressure. 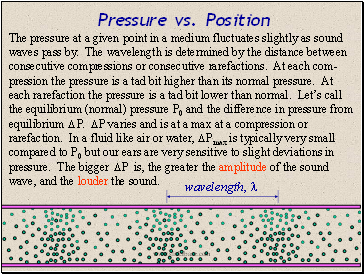 The bigger  P is, the greater the amplitude of the sound wave, and the louder the sound.